Arrival and briefing through our representative. Enjoy a welcome dinner in Luang Prabang. Overnight in a comfortable guest house. An easy ride to the scenic Kuang Si Waterfalls through Khmu and Hmong ethnic villages. Enjoy a swim in the clear-water basins of the Kuang Si Waterfalls. Overnight in a comfortable guest house. A 2 hour transfer by mini van brings you to Kiu Kacham, at an altitude of 1350 meters. For the first part of this stage, you ride between 1000 and 1400 meters to Phou Khoun. After Phou Khoun a long descent with great views brings you to the valley of Kasi (those preferring a shorter distance will start cycling in Phoukhoun, instead). Overnight in a guest house. On this day youre biking through amazing scenery and will descend slowly into the lowland along rivers, limestone formations, and caves. Vang Vieng is a tourist-friendly backpackers hangout located on a beautiful setting between steep limestone rock formations. Overnight in a Resort. Continuing on the main road, you cycle to the ‘sea of Laos’: the 250 square kilometer artificial Lake Nam Ngum. A 2 hour boat ride brings you to the dam, where youll discover some great fish restaurants. After lunch, you continue on a quiet back road through small, hidden valleys and authentic villages. Youll spend the night in comfort at a resort on the banks of the Nam Ngum River. Overnight in resort. 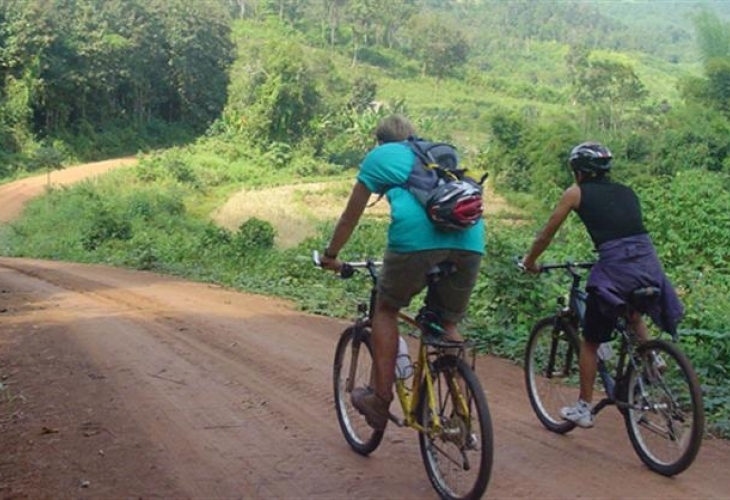 Today, you cycle through paddy fields with fine views in the Phou Khao Khouay mountain range, before entering the capital city of Laos: Vientiane. Youll pass through the suburbs as you cycle to the centre of this historic, lively city situated along the bank of the Mekong. Overnight in Hotel.